You know you need 'em. Lash extensions can magically make you look über gorgeous even without any makeup, and they're a great way to score extra flirty, doll-like eyes. The catch? They're sooo high maintenance and keeping them from getting all tangled up can be quite a pain (not to mention itchy, too!). A clean mascara brush will help comb and separate your lashes. Our technique: Try rolling—not wiggling—the wand as you slowly sweep over your lashes (as if you’re using a cottonbud). This way, you don’t yank out your real lashes. 2. Buy A Shampoo Hat. It looks like a circle with a hole in the middle and we found some at Saizen! It helps keep the water away from your face while you shower, so it won’t weigh down your lashes. P.S. This is how it looks like. 3. Try The Dry & Lift Technique. Post-shower, grab some tissue and place it underneath your lashes. Lift up gently until all the water is absorbed to makes sure that your lashes stay curled longer. 4. Sleep On Your Back. When you smoosh the side of your face over your pillow while you snooze, two things happen: you’ll get more wrinkles, and your faux lashes will sway to the side. Not good. 5. Schedule A Retouch Sesh. Sometimes, you need a pro to get your fringe back in shape. Some lash salons allow technicians to comb through and separate your lashes for you for a minimal fee. It’ll buy you a few extra weeks—soo worth it! Not only is it painful, but it’ll cause crow’s feet, too! Still not scared enough? 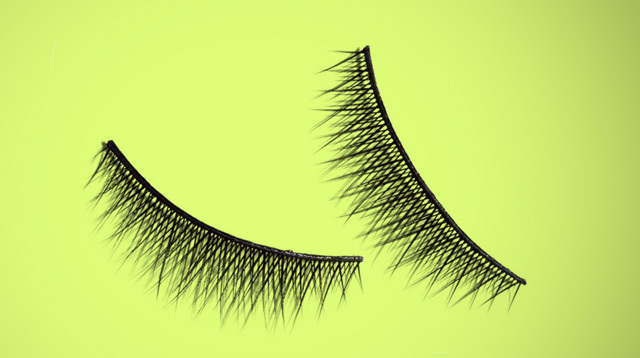 You don’t want your fake lashes to accidentally poke or get lodged into your eyeball. Trust us—it can happen. 7. Don’t Pick On ’Em! It’s tempting–especially when you start to see that a fake lash is hanging on by the tiniest drop of glue. If this happens, dip a cottonbud in oil-based makeup remover to help loosen the adhesive until you can separate the lashes. Didn’t work? Then just head to the salon and have them removed. You’ll save more of your real fringe this way!